Plot: Without giving anything away, the film is about a lazy, petty thief named Gerry Conlon who does some things to upset the IRA so he goes to England to "lay low." Being the drunken buffoon that he is, he soon gets in trouble in England and is sent to a prison and segregated as an IRA terrorist. He is soon joined by his father, whom he despises as weak, but soon learns that his father masks a deep inner strength. This is a true story of a man falsely accused and the horrors he endures at the hand of the British penal system. 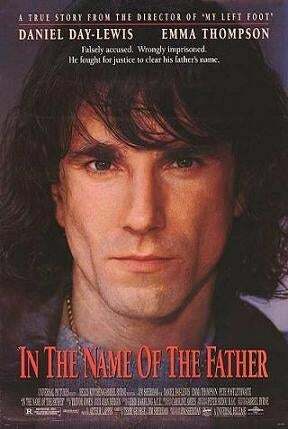 Why you should watch it: In a name: Daniel Day-Lewis. I'd watch this guy act in a local used car commercial. He is one of the greatest actors of our time, and to see his portrayal of a moron who eventually "gets it" is a pleasant contrast to the serious type roles he's usually known for. Pete Postlethwaite is his usual steady self. I don't think he got the credit he deserved in life for being a fantastic character actor. Emma Thompson brings her qualified excellence to this role, and she doesn't disappoint as the lawyer helping the Conlon family try to get out of prison. It's a film about personal growth and the lengths that family will go to help protect their own. Hint - the title has a double meaning. Ooooooooooh! Jim Sheridan is a great niche director. He has a certain style, a certain type of film he in which he is most comfortable directing. This is one of those films. His catalog of directing may be small, but it's worth it to see the movies he makes. I can't speak for Get Rich or Die Tryin', as I've never seen it and I pretty much guarantee I never will. Sheridan is a steady director, always letting the story take center stage. The film was released in 1993, hidden behind such titles as Schindler's List, Jurassic Park, What's Eating Gilbert Grape?, and Philadelphia, so it's easy to see how it could've been overlooked. It was nominated for 7 Oscars that year though. Check it out.